Folks, I need to admit something. I have been suffering from a severe lack of motivation, cooking and otherwise. The weather is grey and I watch in envy as bloggers post about these amazing pumpkin goodies and comfort food meals. I have canned pumpkin puree, more squash than I know what to do with, and I have gotten to the point of storing the CSA potatoes downstairs because I felt too guilty having them stare at me in the kitchen. Yes, taters, I know. I have had some of you for months and I know you are delicious, but I just don’t want to deal with you right now. Stop giving me the evil eyes! The weather is cold and it’s the perfect season for soups, warm dinners, and filling your kitchen with homey smells. But after cooking non-stop for the cookbook, I have (almost) nothing left. We have ordered takeout more in the last week than I think we normally do in one month. I have even started resorting to peanut butter jelly sandwiches. 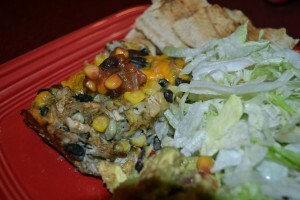 If you have been following the blog, you know I have a thing for chicken enchiladas. I even got all Shakespearean about them at one point. For those of you new to the blog, guess what? I have a thing for chicken enchiladas. Particularly of the salsa verde variety. You can keep your lasagnas and meat loaves, I will take my comfort food sandwiched between corn tortillas with a light, spicy flair. I have perfected throwing chicken breasts (or thighs) into a slow cooker with enchilada sauce, corn, and black beans for the filling, but this time, my lack of motivation came when I went to roll the enchiladas. Suddenly, rolling each enchilada individually seemed like way too much work. I thought about just throwing the filling on top of salad and calling it a day, but I really wanted some warm, bubbly enchilada goodness fresh from the oven. And that, my friends, is how this recipe was created. 1. Combine chicken, 2 cans enchilada sauce, black beans, and frozen corn to a 4 to 6 quart slow cooker. Cook on Medium for 6 to 8 hours. 2. Depending on your availability, after 5 to 7 hours, shred the chicken and let it cook in the sauce for the remaining hour. If you are out of the house or don’t have time, don’t sweat it. Just shred the chicken before you proceed to the next step. 3. Preheat the oven to 375 (dgF). 4. 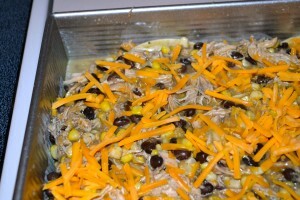 Remove shredded chicken mixture with a slotted spoon and place in large mixing bowl. Mix in 1 cup of cheddar cheese. 5. 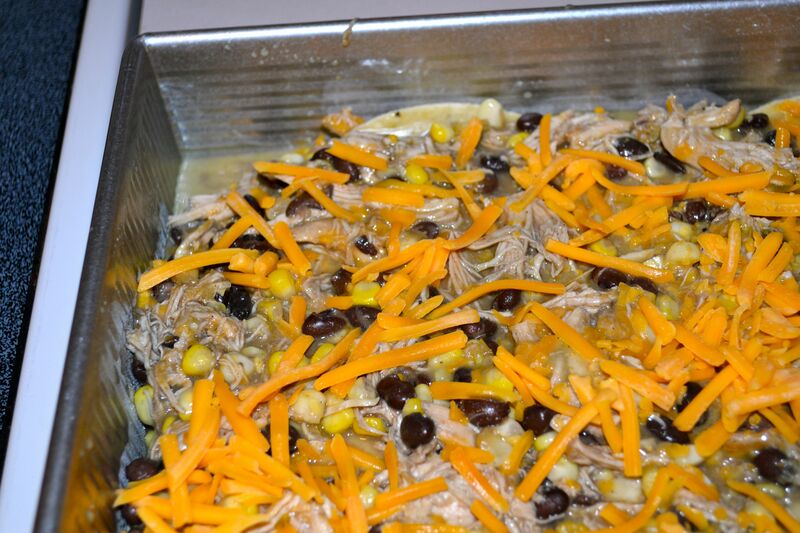 Pour [1/3] of the third can of enchilada sauce into a 9 x 11 rectangular cake pan. Use a spatula to smooth the sauce so it covers the bottom of the pan. 6. 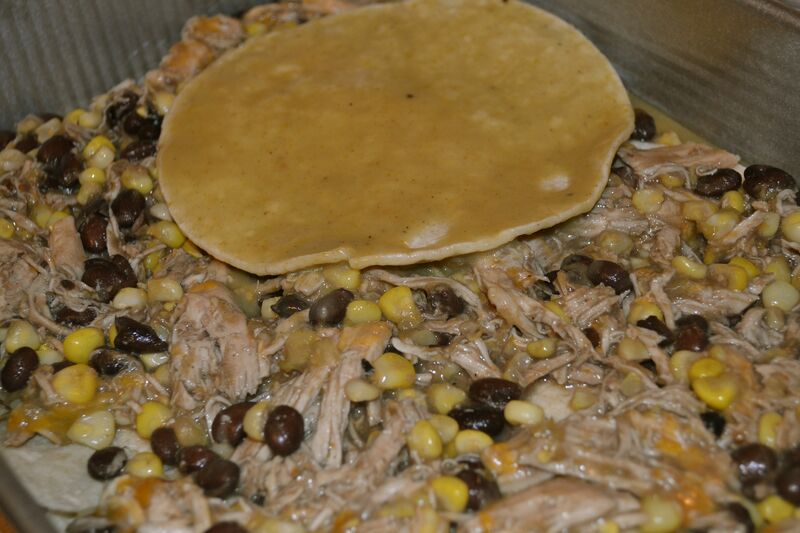 Lay corn tortillas on top of the enchilada sauce. You can either overlap them or split some in half. Just try to cover the sauce with tortillas. 6. Spoon half of the chicken mixture over the top and spread so that it covers the tortillas. 7. Pour the remaining [2/3] can of enchilada sauce in a wide, shallow bowl. 8. 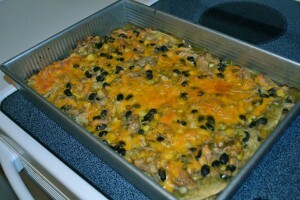 Dip the tortillas in the enchilada sauce and then place on top of the chicken mixture. 9. 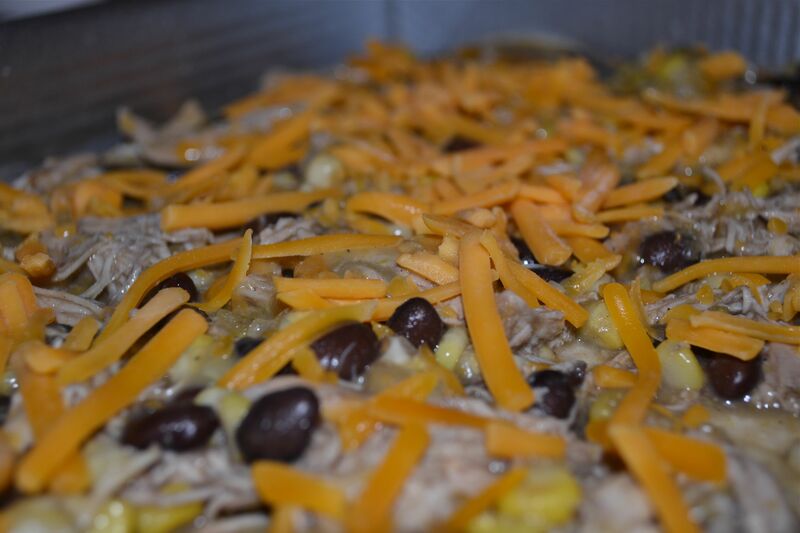 Cover the tortillas with remaining chicken mixture and then top with remaining cheese. 10. Bake for 20 to 30 minutes, until the top is bubbly and it is heated all the way through. 11. 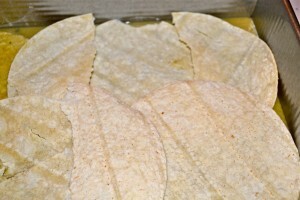 Serve with salsa, shredded lettuce, guacamole, and/or Homemade Baked Tortilla Chips. 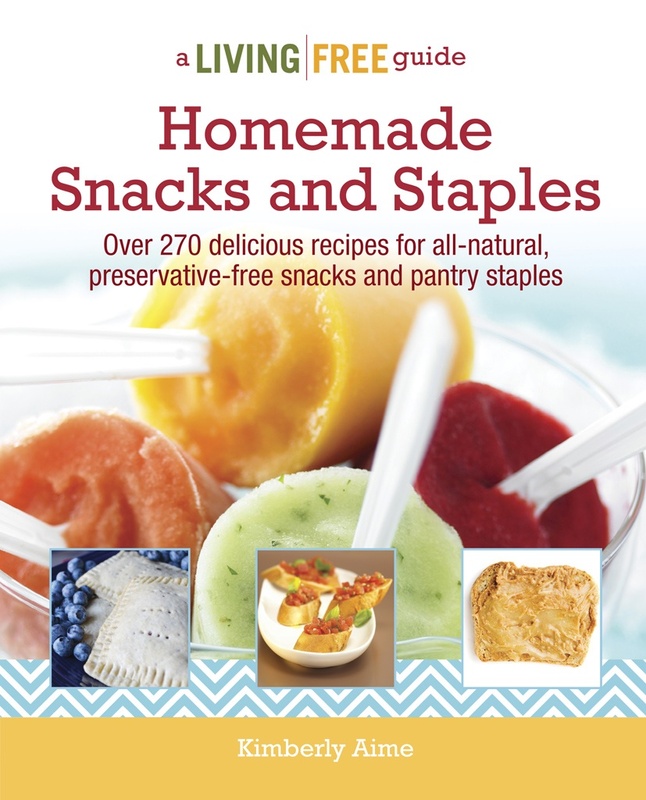 For a dairy-free version, omit the cheese. You really don’t need it. I just happened to have some leftover cheese from another recipe. Don’t like salsa verde? Try it with regular enchilada sauce. Don’t like black beans? Substitute your favorite beans in, or omit them all together. Want to spice it up? Replace the enchilada sauce with your favorite salsa. For me, this recipe = comfort on a plate. 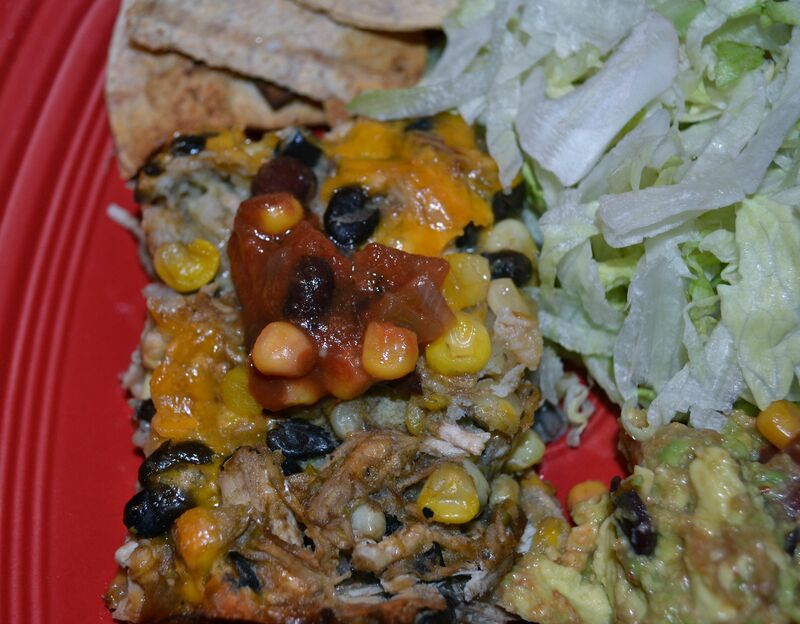 I love the mild spice of the enchilada sauce, the soft corn tortillas, and tender chicken meat. On top of that, I get to eat them with chips and shredded lettuce, two of my favorite things! The clean up for this is an absolute breeze. The corn tortillas soak in the enchilada sauce and nothing really sticks to the pan. It makes great leftovers and is equally good eaten cold (preferably while standing in front of the refrigerator and telling your significant other that you are just checking to make sure you have almond milk for tomorrow’s smoothies). I really hope you try it and would love to hear what you think. As I mentioned, I am totally lacking motivation. What do you do to stay or get motivated? I have been known to blare musical theater soundtracks, sing at the top of my lungs (even while writing blog posts), and turn all the lights on in the house. I would love to hear what you do! 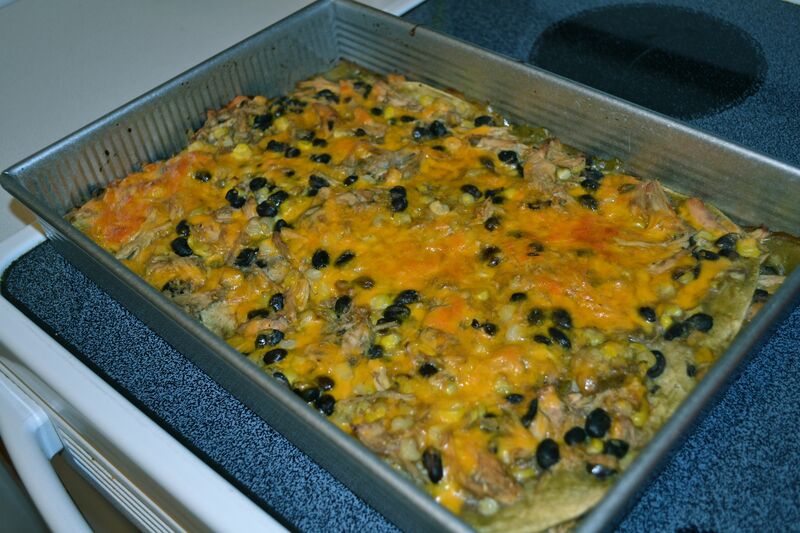 445 Comments on "Lazy Dinners: Chicken Enchilada Casserole"
readers would value your work. If you’re even remotely interested, feel free to send me an e mail. Thank you for another great post. Where else could anyone get that kind of info in such an ideal way of writing? I’ve a presentation next week, and I am on the look for such info. a great author. I will remember to bookmark your blog and will often come back at some point. cheap generic viagra welke viagra beste. Hi there, just was alert to your weblog thru Google, and located that it’s really informative. this in future. 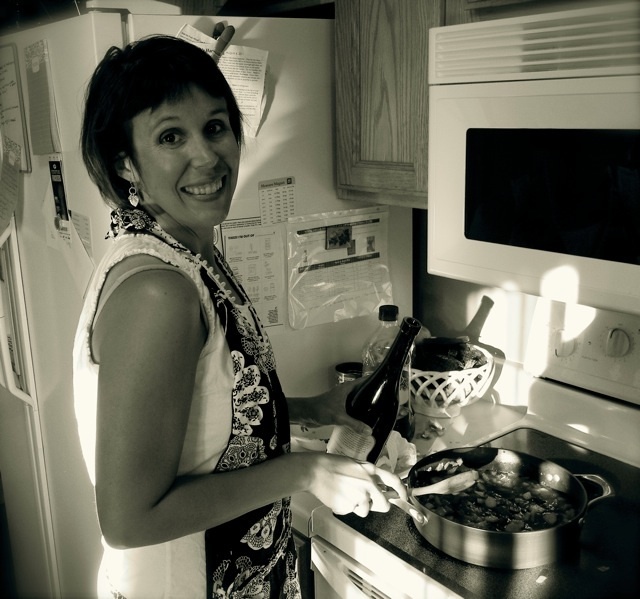 Lots of other folks will probably be benefited out of your writing. Every weekend i used to go to see this site, as i want enjoyment, as this this web site conations actually fastidious funny data too. this topic to be actually one thing that I feel I would by no means understand. cnmmpg,Very helpful and best artical information Thanks For sharing. approximately this topic for a while and yours is the best I have found out so far. adwkqyurwwYeezy Shoes,Definitely believe that which you said. Your favourite justification appeared to be on the net the simplest thing to remember of. gbpcmozn,Some really nice stuff on this website, I enjoy it. I do not know whether it’s just me or if perhaps everybody else experiencing issues with your site. ddgbryzwfr,Wonderful one thank you so much ! It’s awesome in support of me to have a site, which is valuable designed for my experience. pka value of tadalafil [url=http://cialisle.com/]buy cialis[/url] take cialis before after meal. a lot approximately this, such as you wrote the e book in it or something. bit, however other than that, that is excellent blog. website and in accession capital to claim that I get in fact loved account your weblog posts. Anyway I’ll be subscribing for your feeds and even I success you access constantly fast. здесь покупали по низкой цене и весьма довольны. surqccz,Hi there, just wanted to say, I liked this article. It was helpful. Keep on posting! to check out your blog on my iphone during lunch break. I love the knowledge you present here and can’t wait to take a look when I get home. a long time. Wonderful stuff, just wonderful! What a information of un-ambiguity and preserveness of valuable knowledge about unpredicted emotions. nzugbm,Hi there, just wanted to say, I liked this article. It was helpful. Keep on posting! web and on web I found this web site as a finest website for most up-to-date updates. I needed to thank you for this excellent read!! I certainly loved every little bit of it. I stumbleupon on a daily basis. It will always be exciting to read content from other writers and practice a little something from their web sites. I hope to present one thing back and aid others such as you aided me. logo new reader. What may you suggest about your put up that you made some days ago? to your blog. Is this a paid theme or did you modify it your self? is uncommon to look a great weblog like this one these days..
help prevent content from being ripped off? Thank you, I have just been searching for info approximately this subject for a while and yours is the greatest I’ve came upon so far. Hi, I would like to subscribe for this webpage to take latest updates, thus where can i do it please help. Thank you a bunch for sharing this with all people you actually realize what you’re speaking about! long does it stay hard with viagra. I do not know whether it’s just me or if everyone else experiencing problems with your blog. It looks like some of the text within your posts are running off the screen. Can somebody else please comment and let me know if this is happening to them too? all important infos. I would like to look extra posts like this . be a enjoyment account it. Look advanced to more brought agreeable from you! here, certainly like what you are stating and the best way by which you say it. Extremely helpful info particularly the last part 🙂 I care for such info much. Good web site you have got here.. It’s difficult to find good quality writing like yours these days. was once a amusement account it. Glance complex to far introduced agreeable from you! I must say this blog loads a lot faster then most. Can you recommend a good hosting provider at a honest price? I have read so many posts about the blogger lovers except this article is really a pleasant post, keep it up. You need to take part in a contest for one of the finest blogs online.